China has agreed in principle to extend an economic relief package to Pakistan. 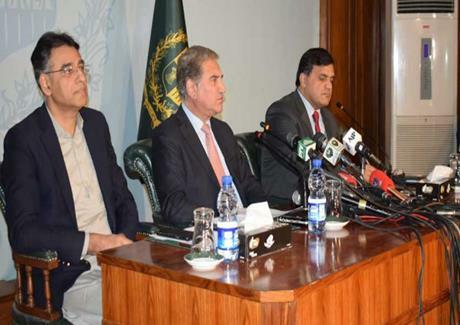 This was stated by Finance Minister Asad Umar and Foreign Minister Shah Mehmood Qureshi while briefing the media persons in Islamabad on Tuesday about Prime Minister Imran Khan's China visit. The Finance Minister said that the Secretary Finance and the Governor State Bank of Pakistan will be meeting the Chinese officials on Friday to discuss the modalities of the package. Asad Umar said the cushion provided by Saudi Arabia and the one to be given by China as well as the budgetary measures have helped Pakistan address the immediate balance of payment crisis. He, however, added that we will have to focus on enhancing our exports and support the industries and the agriculture sector in order to permanently address the balance of payment crisis. On the occasion, Foreign Minister Shah Mehmood Qureshi said the depth of Pak-China relations should not be seen only in the context of financial package. He said China has always helped Pakistan in difficult times and most recently it extended help in the month of July. When asked about the visit of US Deputy Assistant Secretary of State Alice Wells, the Foreign Minister said the two sides have discussed matters pertaining to promotion of trade and energy cooperation. He said all the indicators from the US side are opening up. He said the US side has also offered to play a positive role on Pak-Afghan water issues. Foreign Minister Shah Mehmood Qureshi said Prime Minister Imran Khan's visit to China has helped convert bilateral strategic relations into economic partnership. He said the Pakistani delegation effectively highlighted economic dimension of the relationship during the visit. Foreign Minister said there were four main objectives of the visit, and progress has been made in all of them through fifteen agreements, memoranda of understanding and discussions with the Chinese leadership. He said the two sides agreed to upgrade strategic dialogue to foreign minister level. It was also agreed that prisoners of the two countries will serve their remaining sentences in their respective countries. He said MoUs have been signed to learn from China's experience in poverty alleviation and also for transfer of technology to Pakistan to increase productivity in agriculture. Shah Mehmood Qureshi said discussions were held to increase exports to China so that the country's economy could be stabilized. He said negotiations on second phase of Free Trade Agreement will hopefully be completed in April next year, and the agreement will be signed on the occasion of Belt and Road Forum. The Foreign Minister said the two sides also discussed ways to improve foreign exchange reserves of Pakistan. He said the technical level talks between the two sides in this regard will be held on Friday in Beijing, and the Foreign Secretary will represent Pakistan in it. He said it was also discussed that local currencies should be given priority in trade to reduce pressure on dollar. Shah Mehmood Qureshi said the priorities in the next phase of CPEC were also discussed to achieve progress, prosperity and connectivity. He said industrialization, establishment and activation of special economic zones, transfer of technology for increase in agriculture productivity, job creation, housing, tourism, livelihood, and skill development of workforce will be focused on the next phase. He said ways were also discussed to accelerate pace of development of Gwadar Port. Shah Mehmood Qureshi said Prime Minister Imran Khan held meetings with the Chinese President, Prime Minister, Chairman National People's Congress and Vice President and discussed the entire gamut of bilateral relations and regional and international issues, including possibility of talks with India, situation in Afghanistan, and counter terrorism cooperation. He said a trilateral meeting among Pakistan, China and Afghanistan will be held in December to discuss the Afghan issue.